James Calvin, vice president for Academic Affairs, speaks at the National Academic Talent Development Program (NATDP) forum. Photo by Asharaf Abdulrahman. 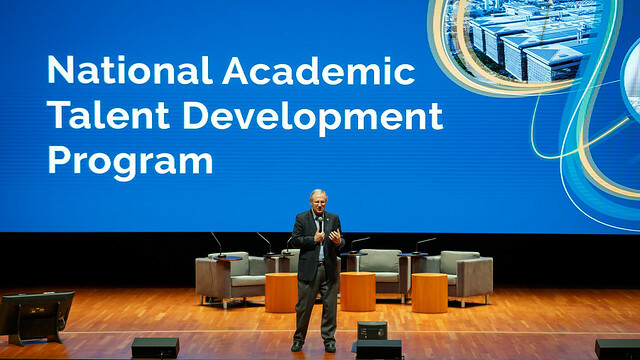 The University recently held the third symposium of its National Academic Talent Development Program (NATDP), bringing together 140 institutional leaders, faculty and prospective students from 18 Saudi universities for a day that focused on strengthening research and education for the Kingdom through partnerships with KAUST. With these partnerships, NATDP is cultivating the next generation of talented researchers and faculty members for Saudi Arabian institutions. The program brings teaching assistants and lecturers to KAUST who are sponsored by their home universities for the advanced degrees, training and development required to become impactful future faculty. Following their time at KAUST, members of the program return to their home institutions, where they embark on new careers as professors. Brian Moran, dean of Graduate Affairs, speaks at the National Academic Talent Development Program (NATDP) forum. Photo by Asharaf Abdulrahman. "The NATDP is one of the University's most important contributions to building a national scientific infrastructure able to accommodate and drive the Kingdom's transformation priorities," said Najah Ashry, vice president of Saudi Affairs, which administers the program. "We work with more than half of the universities in Saudi Arabia to significantly enhance the nation's research and education capacity by addressing the vital need for the development and training of this next generation of Saudi faculty." Each year, guests of the symposium visit campus to learn about the University's latest breakthroughs in research; contributions to national economic and talent development; and ongoing opportunities for students seeking doctorate degrees and postdoctoral fellowships. This year, they engaged in discussions with KAUST faculty and researchers on work in fields including mechanical engineering, Earth science, computer science, electrical engineering and Red Sea research. KAUST hosted over 200 participants from 20 Saudi educational institutions at its annual National Academic Talent Development Program. Photo by Asharaf Abdulrahman. The symposium also highlighted the many research partnerships KAUST has with academia and industry throughout the Kingdom and internationally. These provide unprecedented learning and collaboration opportunities for prospective students who want to be a part of the strategic research making a difference in the country. Guests also heard from KAUST leadership about the University's mission to invest in Saudi talent beyond the lab and classroom, including through comprehensive entrepreneurship and innovation support. Guests also met with current KAUST students to hear about their work, gain insight into life at the University and learn about the ways to flourish as a world-class researcher. For prospective new students and their faculty and institutional leaders, a special session was presented with advice on beginning the KAUST journey. 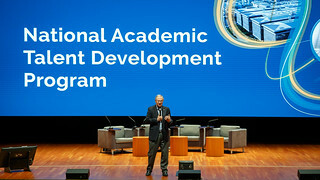 This included a discussion about KAUST admissions and an in-depth exploration of the University's three academic divisions and fields of study available to students. A highlight of the event was a selection of success stories of NATDP program alumni who are now at institutions throughout the country contributing as faculty and academic leaders. Dalal Alezi, a KAUST alumna of the program, gave a keynote address about her experience at KAUST, the doors it opened for her professionally and personally and how her academic journey with the University has allowed her create impact in her new role as an assistant professor of chemistry at King Abdulaziz University in Jeddah. "I thank KAUST for helping me find my passion," Alezi said in her closing remarks. "We have been given all the tools to succeed."